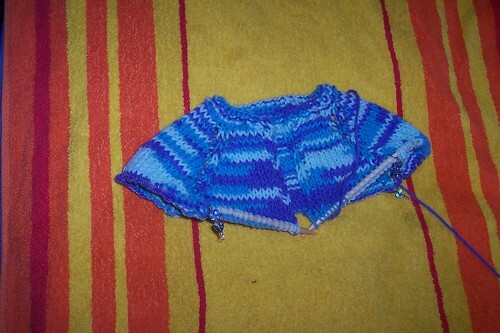 Mummsie’s mystery Knit-a-long « T-Bird\’s crafty Blog! Well, we are up to day 3 of this KAL. It’s worsted weight (DK for us Brits!) worked on 6mm needles which gives a soft drape as the needles are too big really for the yarn. Day 1 was cast on and work 4 rows in moss stitch. I assumed we were doing a scarf…..
Day 2 we put stitch markers at strategic points along the work and worked a yarn over at either side of each marker on every other row for 20 rows. Obivously not a scarf then….. I had an idea what it might be though…. So here’s what it looks like, not quite got 32 sts for the sleeves yet but wanted to grab a pic of it before the sts get too bunched up on my cable – it’s not a long one, I usually only knit little things! Right… now working from either end of the work (it’s symetrical after all…) you have the moss stitch (seed stitch) boarder followed by the first section before marker number 1. Then there are the yarn over, knit one, yarn over stitches followed by the second bit which looks remarkably raglan-sleeve-ish to me! Then after the next marker and YO etc is the largest section (the back) followed by another sleeve and then the short bit and moss stitch boarder. Okay, maybe if I fold it over it will look clearer, can you tell waht it is yet? Click on the pictures to go to Flickr where you can see larger images if you need to! This entry was written by tbird and posted on 20 November , 2007 at 8:46 pm and filed under knitting. Bookmark the permalink. Follow any comments here with the RSS feed for this post. Post a comment or leave a trackback: Trackback URL. Where can i join this KAL? It looks like fun and (if it is a sweater) breaks it down into easily manageable pieces. Hi Autumn. You would need to join the Yahoo group “knittingMadeEasy4You” to get the info. 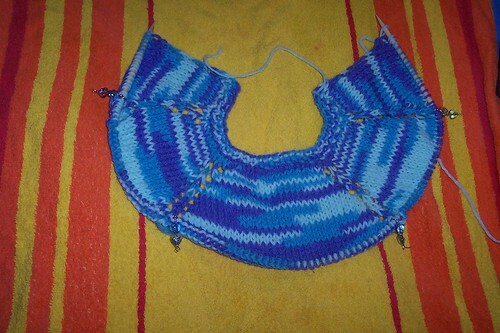 I don’t think it’s going to be a sweater as there is no sizing variations. I’m pretty sure it’s either a capelet or a Faroese style shawl.